The supermassive black hole in the center of our galaxy, known as Sagittarius A*, is pretty quiet for a black hole. 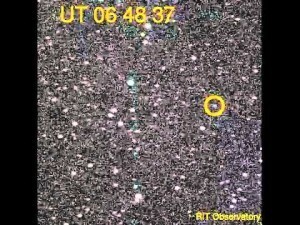 It does however flare up from time to time, when material is captured, as can be seen in images from the NuSTAR x-ray telescope. Of course, x-ray astronomy with enough sensitivity to observe x-ray flares at galactic center is a fairly recent development. It would be nice to have a range of data spanning decades, or even centuries. While we can’t turn back the clock to see past activity of our galaxy’s black hole, we can see past activity through their reflection by gas and dust in the central region of the galaxy. Imagine striking a match in a dark room. When the match is struck, light streams away from it. Some of the light streams in your direction and reaches your eyes. But some of the light streams away from you. It reaches the far wall of the room, and then reflects back toward you. This happens much too quickly in a dark room, but if you could watch in super super slow motion, you would see the light of the match, then later see the walls glow from the light of the match. At cosmic scales we can see such an effect. 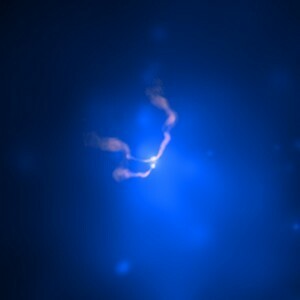 As the supermassive black hole flares up, x-ray light streams away from the black hole. Some of the light we would see directly, but some of it streams in other directions, and can travel for years or decades before reaching clouds and dust in the central region. These dusty regions then reflect some of the light, which we see as an x-ray glow years or decades after the initial flare. This is exactly what a team observed, as presented in a recent article in Astronomy and Astrophysics. 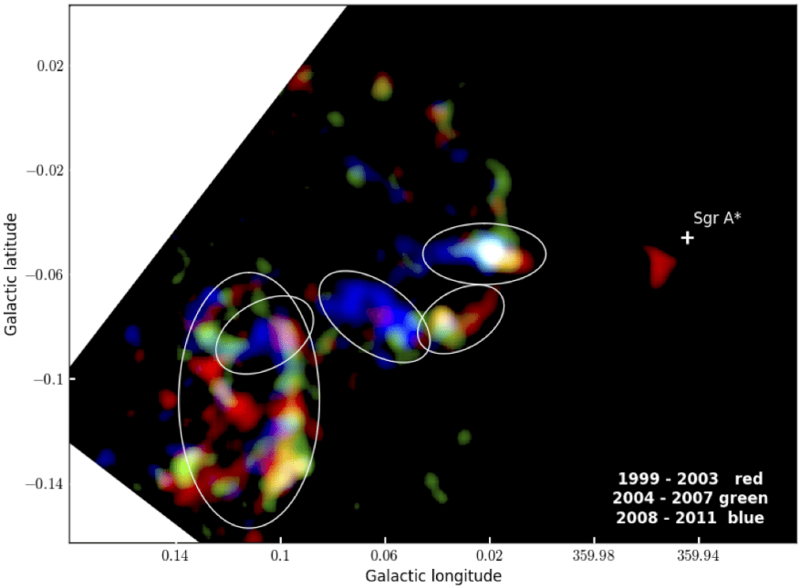 The team looked at x-rays coming from molecular clouds in the region of galactic center over a period of 12 years. What they found was a distinct flow of x-ray illumination as the x-rays from a central black hole flare struck closer regions of the molecular clouds first, then later regions. You can see this in the image from the article above, which shows the earliest x-rays in red, then green and blue. In a few of the circled regions you can see a distinct pattern of red to blue moving from right to left. Other regions are more varied. Since the x-rays have a distinct shift over time, this means the initial flare occurred over a brief time span (a few years or so). Given the estimated distance of the molecular clouds from the central black hole, the active period of the supermassive black hole would have been roughly a few hundred years ago. With higher resolution observations, we should be able to map the dust clouds through reflected light, as well as gain a better understanding of the active and quiet periods of Sagittarius A*. All from an echo of light in the night sky.